Do not allow growing bed mix to dry excessively as increased levels of abscisic acid can form that can reduce plant and subsequent flower life. Common relatives include sunflower, daisy, chrysanthemum, aster, endive and lettuce. Flower heads 3-5 inches wide, open flat at end of scape, outer rows of ray flowers have colorful, strap-shaped petals, inner disk flowers tubular. Flower stems are leafless (scape), 24-36 inches long, and can be hollow. Plant is a herbaceous perennial, classed as a dicotyledon, leaves not parallel veined. It has been reported by a few growers that some cultivars show chill damage when stored at the recommended temperature range of 32-34F and therefore should to be stored at warmer temperatures (~40F). However, research efforts to substantiate these reports were unable to confirm it. Thus, store gerbera at 32-34F. Some tests show that they can be stored up to 3-4 weeks. Because the gerbera flower will naturally turn its head toward the sun, its often hollow and always leafless stem can be wired to keep the daisy standing tall. However, using wire will not extend vaselife. Genus named after Traug Gerber, a German naturalist and the specific epithet (jamesonii) after Jameson, one of the discovers of the species. Harvest/use flowers when outer rows of disk flowers are showing pollen. Hang flower heads through a wire net when first hydrating them to promote straight stems. Fluoride in some water supplies can cause petal tip burn with many cultivars. Kerssies (1994) found that gerbera flowers of higher turgor are more susceptible to Botrytis. During the production of these flowers, fertilization schedules can be altered to reduce turgor. The same can be achieved after harvest by using pretreatment or vase solutions low in salts and sugars. 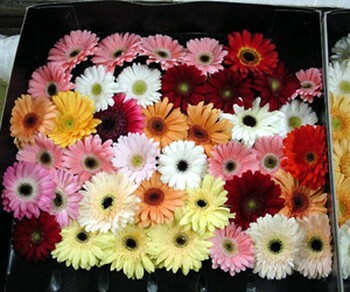 Ron Smit provided the following colors and percentages of each that are available gerbera daisies: Red 20% Hot Pink / Purple 17% Pink 15% Orange 13% Yellow 12% White 5% Novelties 6% Bicolors 6% Peach 2% Apricot 2% Salmon 2%. Kind regards.